In this power, the server is running FreeBSD 10.3. I am completely and unreasonably biased: ZFS is the best filesystem out there. Do not take my word for it. Ask around. Today, I started a process I’ve been waiting to do for a while. I am replacing the 3TB drives in a 10-drive raidz2 array with 5TB drives. These new drives are faster, I think perhaps cooler, and, more to the point, bigger. Drives can be replaced, one at a time, until they are all 5TB drives. Then, if you’ve set zpool set autoexpand=on, your zpool size will magically expand. If you have spare slots, or in my case, free space inside the case, you can add a new drive, then issue the replace command. Why do it that way? Read this from the zpool Administration section of the FreeBSD Handbook. There are a number of situations where it may be desirable to replace one disk with a different disk. When replacing a working disk, the process keeps the old disk online during the replacement. The pool never enters a degraded state, reducing the risk of data loss. 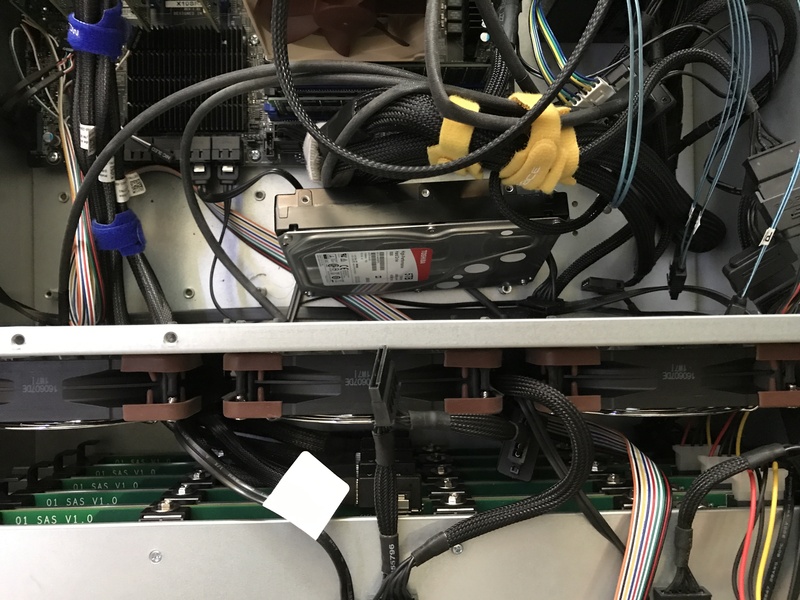 zpool replace copies all of the data from the old disk to the new one. After the operation completes, the old disk is disconnected from the vdev. This is far superior to what I did for my last zpool upgrade. I pulled a drive, plugged a new one in. Not ideal. I do recommend this approach. I merely present for your education as to how to not do things. In the image below, you see knew, my main storage server. 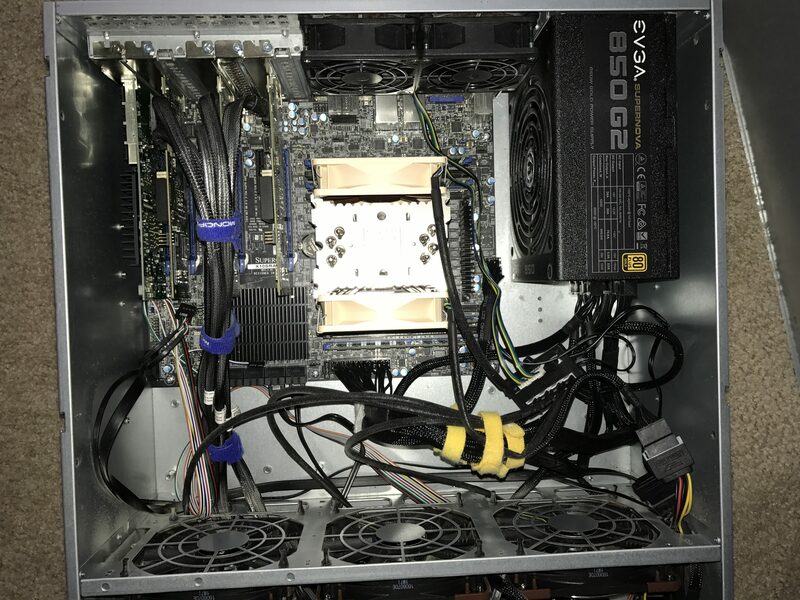 It is a 5U case with 20 hot-swap drive bays, all full. Your keen eye will note that that the mps2 has an empty connection SFF-8087 connector. I connected one up and attached it to the disk, and found a spare power connector. In this photo, you can see how securely I have attached this drive. I racked the server and powered it up. After powering up the server, I saw this information. That’s the drive I need to format. Now it is ready for ZFS to use. What does the pool look like? This is the pool in question. Here are some details. It is a 10x 3TB raidz2 array. I’m going to work on replacing that da2 device first. I set this on, so that once the drives are all replaced, the size will automatically expand. The first device listed is already in the pool The second device is the new device. boot code on newly attached disk 'da20p3'. Remember to do that last part from above. It will ensure you can boot. Note that it is not DEGRADED. SCORE! Stay tuned for more updates. I have 9 more drives to replace. Note the times. The zpool replace command and the vdev state change are related. For what it’s worth, the above review of log entries led to another blog post. The resilvering complete succesful. da2 is no longer part of the array, but da20 is. 1 more hour to go for the last 5TB drive.